From time to time, dogs can and will get diarrhea. Whether it is because of a change in diet, or stress, or digging up some smelly thing in the backyard and eating it, your dog’s digestive system will react to the “digestive intruders” in the most unpleasant way. Being prepared for these inevitable episodes will help your dog recover faster than waiting for a vet appointment or waiting until you can get to a store to buy something that might help. First of all, you should know that all diarrhea episodes are not minor or usual. Some are actually signs of a more serious medical condition. If after trying a few home remedies for a day or two you see no progress at all, then it is time to get an expert medical opinion from your vet. Your dog may have contracted a parasite or more dire condition that only a vet can diagnose and treat. That being said, most diarrhea in normally healthy dogs can be addressed easily at home. Many people, vets included, suggest a bland diet of white rice and chicken. This will not work for most cases of diarrhea because neither of these foodstuffs address the underlying cause of diarrhea in dogs which is an imbalance in their digestive system. Fiber from rice won’t fix the toxins or the smell or the gas associated with diarrhea episodes although it will help with the texture of their bowel movement. The problem is balance. Unless you fix the problem, things like rice and pectin won’t do anything but put a temporary bandage on the situation. Dr. Jeff developed DiarRice for most cases of dog diarrhea. This is something every dog parent should have in their medicine cabinet or pantry for the inevitable next time their dog gets diarrhea. It’s going to happen at some point this year. Why not be prepared? Unlike other over the counter medications for diarrhea in dogs, DiarRice contains the right probiotics that address the underlying cause: intestinal imbalance by replacing bad bacteria with good bacteria. DiarRice promotes gut health, aids in digestion, suppresses the growth of gas producing bacteria, aids in fighting off diseases, helps food absorption, helps eliminate toxins and resets the pH balance. It is made just for dogs and their unique needs. Not cats and not people. Using things like Pepto Bismol and Imodium to treat dog diarrhea come with their own risks. Why risk your dog’s health and suffer another day of discomfort? Stock your pantry with the only dog diarrhea treatment that is formulated by a vet with a taste dog’s love. Get DiarRice for your dog and your peace of mind. Veterinarians often recommend a multi-strain probiotic for their canine patients. Many high-quality multi-strain probiotics contain from five to six strains. If five or six is good, is ten to twenty better? Another factor you should also take into consideration when selecting a probiotic for your dog is that there are specific probiotic strains that will address specific gut conditions. We have formulated DiarRice with only the strains that address the symptoms and discomfort that accompany diarrhea in dogs such as runny stools, smell, gas and eliminating toxins. Many dog probiotics have more than 15 strains in them and are designed to be a one-size-fits-all solution to any gut condition a dog might have. When selecting a probiotic for your dog, you should choose one that is specific for the condition you want to treat at that time. Choosing one that has too many strains may not yield the results you are looking for and may do nothing at all if the strains don’t survive until the expiration date. Dogs that have returned from hunting trips with diarrhea is a common reason for patients to visit Dr. Jeff’s vet office. Some dogs just seem to get into everything out in the field and what they get into typically can interfere with their normal digestive processes. Pond water, or any change in water, is a reason that dogs can come down with a case of diarrhea. If your dog is water sensitive, try bringing water from home or pack some bottled water for them to drink in the field. Dogs get thirsty no matter what the temperature and you will want to make sure there is plenty of safe drinking water for them throughout the day. Chewing on sticks or things that smell interesting can also cause diarrhea in dogs. Trash that people have left outdoors is another reason for diarrhea. Dogs should be kept away from garbage as much as possible as it can contain harmful or spoiled foodstuffs that dogs just should not eat. For the hunting dogs that return home with a case of diarrhea, we make sure that they have a supply of DiarRice to take home with them. It will address their current condition practically overnight. Importantly, it is good to start them off on a few servings of DiarRice before their next outing to keep diarrhea from spoiling the next hunting trip. When DiarRice is used in this way, we have found that hunting dogs do not contract diarrhea either from eating something or from the stress of the hunt. There are quite a few probiotic powders for dogs on the market. Some are good. Others, like DiarRice, are excellent. What is the distinction between a really good probiotic and an okay one? As a consumer and dog owner, you probably want to know that the ingredients in the probiotic you give to your dog are good quality and natural. Not all probiotics for dogs treat all conditions or support overall digestive health. DiarRice, for example, is a product that has been expressly formulated to treat diarrhea in dogs. 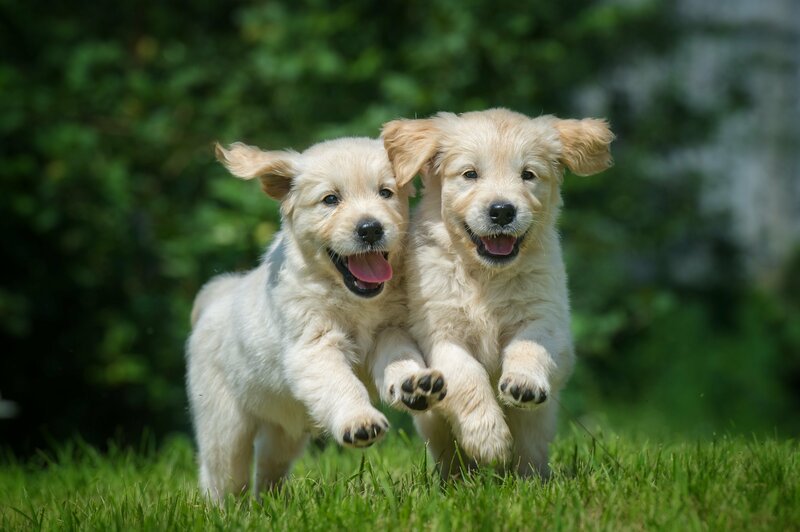 Although there are other benefits that DiarRice provides such as overall good digestive health and a balanced GI tract, its ability to quickly address the discomfort and symptoms of diarrhea is what makes this product unique among all probiotics that you might want to choose for your dog. The reason DiarRice works so fast is that it also has a prebiotic in its patent-pending formula. You can think of a prebiotic as “food” that feeds the good flora in your dogs gut. When bad flora outnumbers good flora, and bad flora is secreting toxins, an imbalance occurs in a dog’s GI tract causing discomfort and diarrhea. DiarRice delivers good flora to your dog, and DiarRice’s prebiotic feeds that flora so it can proliferate and overpower and dramatically outnumber the bad flora. There are a lot of probiotic powders on the market for dogs. Probiotic microorganisms do not live very long in a dog’s gut. By incorporating a prebiotic with the diarrhea-specific probiotics in DiarRice, it gives the good flora an advantage over the bad flora when it comes to longevity and reproduction. More good flora means the gut returns to a balanced state quicker…and that means a quicker resolution to the diarrhea symptoms your dog experiences. How fast can DiarRice work? Pictured above is Buckeye. Buckeye’s owner was able to have DiarRice delivered the very same day thanks to Amazon same day delivery. 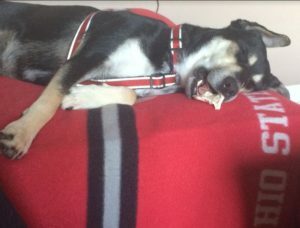 Buckeye’s owner reported that the dog had diarrhea in the morning and solid stools at night after one serving of DiarRice. It is not always possible to take your dog to see the vet for every diarrhea episode – especially with puppies like Buckeye that get into things they shouldn’t. But if you have DiarRice at home, you will save yourself a trip to the vet and a vet bill. You will also save your dog a day or two of discomfort they don’t have to suffer. There are many articles out there that focus on the things that new puppies need in their first months at your home. We’ve seen the “Top 5 Things” and “25 Things” on other blogs – mostly they focus on attractive accessories that fit in with the lifestyle you have. Don’t get us wrong, there is nothing wrong with buying a designer food bowl as it will serve the purpose for which it was intended. Expensive chew toys and therapeutic beds might certainly interest your new puppy, but they will be far more interested in your dirty socks than a woven pull toy. Many a dog owner tries to get their pup to snuggle into their new super, cushy memory foam bed with the dog paw cover when all they really want is to find a quiet corner with an old towel that smells like home. 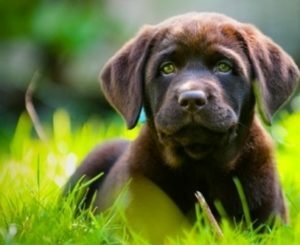 If you are a first-time dog owner and are getting a puppy, here are a few things that you should have before you bring puppy home. Lots of old towels. Puppies will have accidents, will track dirty feet on your kitchen floor, and occasionally get into things they shouldn’t. Other than for clean up, a pile of these towels will give them a place to dig and bury themselves and generally have a great time in a safe environment. If you are going to be crate training your dog, make sure you have food and water bowls that fasten securely to the inside of the crate. These can be plastic bowls or pails hung by hooks. When confined to their crates, a bowl left on the crate floor will get toppled easily and you will be cleaning up that mess as well. Feed the puppy the same food as the breeder did (or where you got the puppy from). If you intend to switch foods, do it slowly and mix the old and new foods together, gradually lessening the amount of old food in the mixture. An abrupt switch in food will cause diarrhea in a puppy or dog. That’s one of the reasons that we recommend having Diarrice in every dog owner’s pantry. You never know when your new puppy will get into something they shouldn’t, and that “something” will usually cause diarrhea. Your puppy will be used to a noisy environment, whether you got your puppy from a breeder, a pet shop or a shelter. Bringing puppy home changes that environment from a noisy chaotic one to a quieter home environment – especially at bedtime. Some people use white noise machines to create soothing sounds the first nights the puppy comes home. Others save a dryer load for bedtime to create a repetitive sound. A window air conditioner in the next room or fan will also serve to provide a hum that can lull puppy to sleep. Until the puppy gets used to their new home, they will be lonely and perhaps a bit afraid so you want to do everything you can to try and provide a calm, hospitable sleeping environment for them. When you bring a puppy home it is the beginning of a loving and trusting relationship that will last all their lives. Your puppy will give you unconditional love and all you have to do is make sure they are fed, there is plenty of water, an opportunity for play and train them to respect your home. The rewards to you will be endless.